The parishioners of Rothley, particularly the members of the Parish Church, paid a glowing tribute to Mr. Hubert Sleath who retired early this year owing to illness after being a parish churchwarden for 49 years, 40 of those years with Mr. Cecil Gee as his colleague who was a vicar's warden at the time. 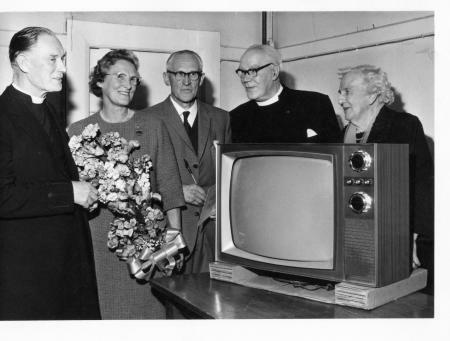 He was presented with a television set and cheque from members of the church and parishioners, a large number of whom attended a social for that purpose in the Village Hall on Wednesday of last week. The vicar, the Rev. J. G. Hunting, introduced the Archdeacon, Ronald Berkeley Cole, who was present to pay tribute to Mr. Sleath for the excellent service he had rendered to the church, particularly at Rothley St. Mary's. Mrs. Ruth M. Packe, one of the oldest members of the church made the presentation. During the years she had been a member of the church and served with Mr. Sleath on the church council, they had eight or nine vicars, but only two parish wardens. She wished to thank him now for "the care and watching brief he had kept on our dear old church so that it had been kept in excellent repair inside and outside. Until his illness, while they had been without a verger, he had also carried out those duties at the church services"
She hoped that Hubert, as he was so popularly known, and his wife would live to enjoy the present they had so willingly subscribed for him, for many more years. Mr. Sleath said that as well as being a big surprise it was such tremendous generosity and he had never expected such a thing. Had he known he would probably have kept on, he remarked amidst laughter. He was only 19 when he took the position, and was probably too young, but no one said anything at the time about it except one old lady, a Miss Pagett, who said he was far too young for the job. The old church was 900 years old and he did not know of anything older in Rothley, except perhaps the Saxon Cross in the churchyard. He hoped the rising generation would take pride in the Parish Church and continue to look after its welfare. Tributes were also paid by the present churchwardens Mr. S. G. Harmer and Mr. R. G. Offley. Mrs. Sleath was then presented with a bouquet by Mr. Paul Bishop.